Meet Victor Frankenstein and Igor. The young medical student turned monster creator and his trusted assistant look every bit the part in the first images released before the movie Victor Frankenstein hits theaters this October. Take a look! 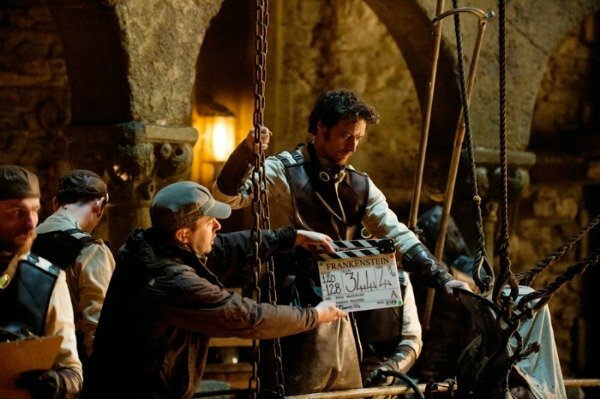 In the images, obtained by Empire, we get our first glance at the costume design and a sneak peek into the tone of the upcoming horror film Victor Frankenstein. In the first image, and of particular note, we see Victor Frankenstein—played by James McAvoy—with a pensive look on his face. Perhaps this shot was taken from a rather intense scene, as the actor looks deep in thought, obviously being careful not to lose the momentum of the intended emotion. The X-Men: Days of Future Past actor is known for his ability to convey deep emotions and in this film, based on the first images, he is doing just that. 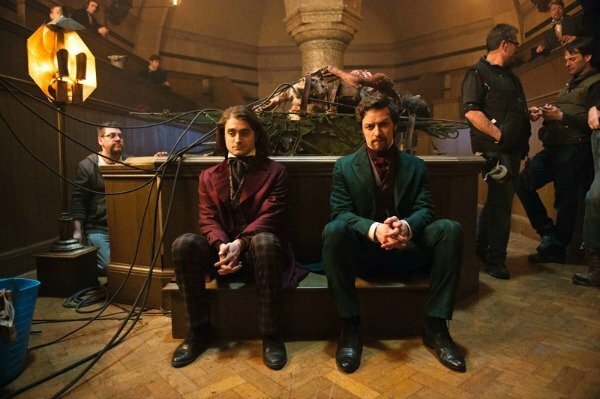 The second image shows both Victor Frankenstein and his trusted sidekick, Igor—played by Daniel Radcliffe. Both actors are pictured sitting side by side on a bench. McAvoy and Radcliffe are seemingly in different head spaces, in what appears to be a moment in between filming. Whatever it was that they were each contemplating in that moment, it is very apparent that the costume design in the film is quite spiffy. Also noted, both the actors are donning rich-colored tailored suits, fit to match their perfectly coifed hair. But what is that over their shoulders? Victor Frankenstein is yet another adaptation of Mary Shelley’s 1818 novel Frankenstein, but with an updated twist. This time, we will all get the opportunity to learn more about the origins of the young aspiring medical doctor who famously went on to create a hideous monster. We also know that Victor Frankenstein will be told from the perspective of Igor, Victor’s troubled friend who later becomes his assistant. As much as the monster is his creation, Igor is his creation as well." So far, there has been word on what the monster will look like, but it’s safe to say based on the images released already, that we are likely in for a horrific treat. You may recall the last Frankenstein film adaptation I, Frankenstein took the story in a completely different direction, relying on the graphic novel of the same name for the basis of its storyline. The plot of I, Frankenstein primarily revolved around Frankenstein’s monster. It underperformed at the box office and was critically panned. However, Penny Dreadful, the latest TV show to feature both Dr. Victor Frankenstein and his monster, has received several accolades since its debut in 2014. Victor Frankenstein, which also stars Jessica Brown Findlay as Lorelei, Andrew Scott as Roderick Turpin, Mark Gatiss as Dettweiler and Callum Turner as Alistair, hits theaters on October 2.